Isaac Arnsdorf of ProPublica wins the September Sidney Award for The Shadow Rulers of the VA, a deeply-reported exposé that reveals how a trio of Donald Trump cronies known as “the Mar-a-Lago Crowd” are calling the shots at the Veterans Administration. Bruce Moskowitz, Ike Perlmutter, and Marc Sherman don’t work for the federal government. None of the three has ever served in government or the military. Yet emails show them giving orders to top VA officials, shaping policies that affect millions of people. “Everything needs to be run by them,” a former official told Arnsdorf, “They view themselves as making the decisions.” But when asked about their role, they insist that they are just volunteers. The trio communicates with senior VA officials daily and gives input on major policy and personnel decisions. VA officials travelled to Mar-a-Lago at taxpayer expense to consult with them. 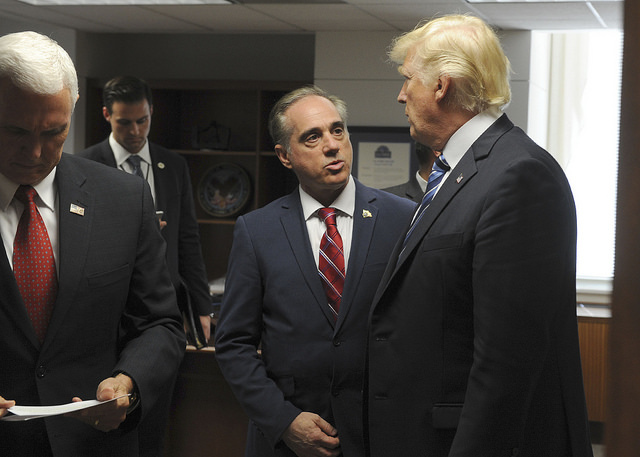 The Mar-a-Lago Crowd played a decisive role in edging out VA secretary David Shulkin, a chief of staff, and other senior officials. Isaac Arnsdorf covers politics, influence and the Trump administration. Before joining ProPublica in 2017, he covered lobbying and campaign finance at Politico. Q: How did you find out that three Mar-a-Lago members had established an unofficial but very powerful grip on the VA? A: I started out trying to understand why Marvel Entertainment chairman Ike Perlmutter was informally advising Trump on the VA — what expertise or interest did a comic book tycoon have in veterans? I heard Perlmutter was having meetings with Trump officials at Mar-a-Lago, but the details were scarce. Then I heard there was also a doctor, and eventually I found out his name. Then I heard about a lawyer, and finally got his name. Once I had the three names and an idea of what records would exist from the meetings, I was able to request documents from the VA under the Freedom of Information Act. Q: Who are these guys and how did they come to wield such outsized influence? A: Perlmutter is a Trump longtime acquaintance and was a campaign supporter. The doctor, Bruce Moskowitz, provides concierge medical care to millionaires and billionaires in Palm Bruce. The lawyer, Marc Sherman, is a friend of Perlmutter’s. None of them has ever served in the U.S. military or government or has any experience running anything like the second-largest federal agency. But the one thing they do have is the president’s ear. Perlmutter is the first person Trump calls on anything veterans-related. If Perlmutter doesn’t get his way on something, he can take it up directly with the president. That access is the source of his power and, by extension, Moskowitz’s and Sherman’s. Q: You made very effective use of the Freedom of Information Act in reporting this story. Can you briefly describe your FOIA strategy? A: The first key was targeting specific documents I knew existed, such as calendar entries, expense reports and emails. The second key was negotiating with the FOIA officers to release documents in batches as they got them while they still searched for more. I followed up with the FOIA officers regularly to check in on their progress. It took more than two months — which is pretty fast for FOIA. So the third key was time. Q: What are some things that clique members have done that might be a conflict of interest? A: A series of calls with Perlmutter led the VA secretary to appear at the New York Stock Exchange with Perlmutter’s company (Marvel), raising ethical questions for agency officials about the propriety of promoting a private business. In another instance, Moskowitz introduced his son to VA and Apple officials to discuss developing an app similar to one his son had made. Q: Is this cliquish arrangement unique in U.S. history, or have other presidential cronies made similar inroads in the past? A: Many presidents have consulted friends and informal advisers, but there’s never been a secret council exerting such direct influence over a specific agency like this. It’s one thing for Trump to casually ask a friend what he thinks about something. It’s very different for administration officials to have to fly to Mar-a-Lago to meet with Perlmutter, Moskowitz and Sherman (sometimes when Trump wasn’t even there), at taxpayer expense and without congressional oversight. There is a legal mechanism for agencies to convene councils of outside experts, but that requires public notice and participation, which wasn’t done here. Q: Can you describe the far-reaching impact that this story has had so far? A: Democrats on the House veterans committee opened their own investigation, requesting additional documents from the VA. Five Senate Democrats called for a hearing, and four requested an investigation by the VA’s inspector general. Also, a veterans group sued the VA, alleging that the Mar-a-Lago meetings violate a Watergate-era sunshine law that requires federal agencies to inform the public when they consult outside experts. The group, VoteVets, wants a judge to order the VA to release records about the trio’s influence and block further meetings until they comply with the law. Q: What did you learn in the process of reporting this story that you will carry forward to you next investigation? A: People were really interested in seeing the underlying documents, so we ended up publishing them a couple days later. You have to be careful with publishing original documents not to compromise sources or expose private information. But in cases where you can, like this one, it clearly helps bolster trust with readers and can lead to future scoops. Q: Did anything funny or unusual happen in the course of reporting this story? A: A source who I was trying to get to talk to me for weeks finally agreed to a meeting — but it had to be at 6:15 a.m., at a location pretty far out of town. It was worth it, though.